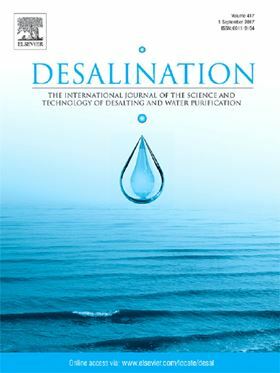 The research article 'A hybrid reverse osmosis/adsorption desalination plant for irrigation and drinking water' has been published in Elsevier journal Desalination (Volume 444, 15 October 2018, Pages 44-52). The hybridisation of brackish water reverse osmosis (BWRO) desalination technology and an adsorption cycle (AD) are considered in this work as a means of producing large quantities of a) water for irrigation and; b) high quality water for domestic use. The RO process and the AD cycle are represented as numerical models and have been optimised to produce fresh water and cooling. An existing RO plant can be retrofitted to become an RO-AD process to improve its specific energy consumptionand simultaneously produce a cooling effect which can be exploited for local process cooling or air conditioning. A pressure exchanger (PX) and AD are combined to recover the reject from the RO, resulting in reduction in power consumption. The hybridised RO-AD desalination processes can be considered as the optimum solution for rural areas due to its capability for the production of water for irrigation and drinking as well as cooling for air-conditioning. Nevertheless, the temperature and feed salinity may negatively effect on RO production, with the AD cycle producing more than 6 m3/tonne s.g of drinking water (<15 ppm) at 85 °C, additionally the AD evaporator is not effected significantly by salinity. The proposed plant could produce 24,000 m3/day for irrigation and 6.3 m3/tonne s.g for drinking as well as 75 RTon/tonne s.g. Another interesting finding was that the minimum specific energy for the combined RO-PX-AD plant with a capacity of 24,000 m3/day is 0.8 kWh/m3 at RO recovery = 45%. The small-scale combined system was also examined to produce 2000 m3/day and cost of different configurations was estimated as well. The results showed that the cost of the combined RO-AD system is the lowest, 0.44 £/m3compares with other RO configurations. This study set out to determine if an advanced water treatment plant could produce potable water at minimal environmental impact. Two different Pd-Ag supported membranes were prepared and tested in a FBMR. Pressure-driven membrane operations, such as nanofiltration and reverse osmosis, and thermally-driven ones, like membrane distillation, are compared.